A survey forPrays acmoniasMeyr. and its natural enemies was made in the northern hills in Pakistan. It attackedViburnum spp. in the Murree hills, Azad Kashmir and Swat. Its populations were generally low at most localities.Deraecoris sp.,Haplothrips sp. (egg predators),Apanteles sp. nr.dilectusHal.,Elasmus hyblaeaeFerrière,Elachertus sp.,Euderus sp. andSympiesis sp. (larval parasites),Sphedanolestes sp. (larval predator),Aspergillus flavusLink andStreptococcus sp. (pathogens) attackedP. acmonias. Among theseApanteles was more common throughout the distribution area of the host and destroyed up to 13% host larvae. It appears to be a possibly promising parasite for trials in areas wherePrays spp. are pests. However, it did not parasitizePrays oleae (Bern.). 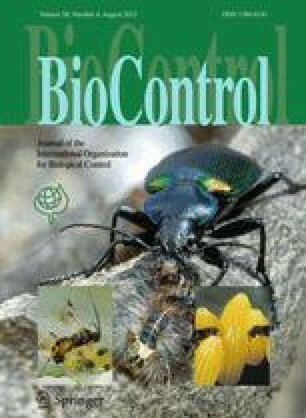 This work was sponsored by the Food and Agriculture Organisation of the United Nations as a part of the project entitled “Research on the control of olive pests and diseases in continental Greece, Crete and Corfu”. Cette chenille qui attaque lesViburnum spp. dans les collines du Nord du Pakistan s'y trouve généralement en faibles densités.Deraecoris sp.,Haplothrips sp. (prédateurs des œufs),Apanteles sp. nr.dilectusHal.,Elaemus hyblaeaeFerrière,Elachertus sp.,Euderus sp. etSympiesis sp. (parasites des larves),Sphedanolestes sp. (prédateur des larves),Aspergillus flavusLink etStreptococcus sp. (germes pathogènes) sont les ennemis naturels deP. acmonias. Le plus commun estApanteles, qui peut détruire jusqu'à 13% des chenilles. Il peut être un parasite intéressant pour la lutte contre desPrays spp., mais il ne parasite pasPrays oleae (Perm. ).